This video shows a PBVS on a 6-DOF robot arm with (c*^t_c, theta u) as visual features. It corresponds to the results depicted in Figure 34.10. A mobile robot with a pan-tilt camera is asked to to navigate in a square arena with low walls and located in an office. 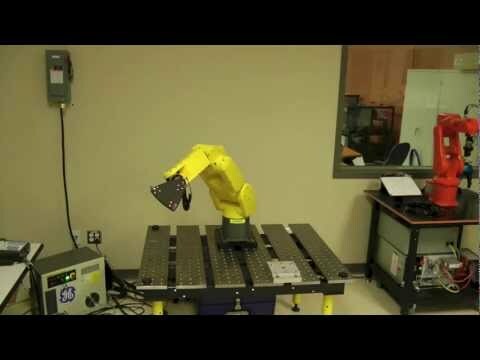 This video shows excerpts from the process of calibrating a FANUC LR Mate 200iC industrial robot using two different methods. In the first method, the position of one of three points on the robot end-effector is measured using a FARO laser tracker in 50 specially selected robot configurations (not shown in the video). Then, the robot parameters are identified. Next, the position of one of the three points on the robot's end-effector is measured using the laser tracker in 10,000 completely arbitrary robot configurations. The mean positioning error after calibration was found to be 0.156 mm, the standard deviation (std) 0.067 mm, the mean+3*std 0.356 mm, and the maximum 0.490 mm. In the second method, the complete pose (position and orientation) of the robot end-effector is measured in about 60 robot configurations using an innovative method based on Renishaw's telescoping ballbar. Then, the robot parameters are identified. Next, the position of one of the three points on the robot's end-effector is measured using the laser tracker in 10,000 completely arbitrary robot configurations. The mean position error after calibration was found to be 0.479 mm, the standard deviation (std) 0.214 mm, and the maximum 1.039 mm. However, if we limit the zone for validations, the accuracy of the robot is much better. The second calibration method is less efficient but relies on a piece of equipment that costs only $12,000 (only one tenth the cost of a laser tracker). The video illustrates and explains one of the final showcases of the European project LIREC (http://lirec.eu/project) in the University of Hertfordshire Robot House. The Sunflower robot, developed at UH, provides cognitive and physical assistance in a home scenario. In the video, one of the researchers, Dag Syrdal, explains a typical session in long-term evaluation studies in the Robot House. Sunflower has access to a network of smart sensors in the Robot House. The video also illustrates the concept of migration (moving of the robot's mind/AI to a differently embodied system). In marsupial teams, a mother robot carries one or more daughter robots. This video shows that a mother robot can opportunistically treat daughter robots as surrogate sensors in order to autonomously reconfigure herself to recover from sensor failures. SRI's robot Shakey (built 1966-1972) was the first mobile robot that could reason about its surroundings. This 1969 movie provides a good look at how Shakey worked. 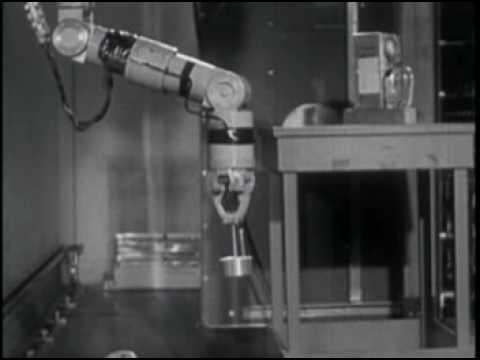 This clip shows the use of a remotely-operated arm to protect a worker from nuclear radiation, taken from the 1954 film sponsored by General Electric, The Atom Goes to Sea 1954. The scene is at the Knolls Atomic Power Laboratory in Schenectady, New York. The entire film is available from the Internet Archive.